This drill focuses on the basic concepts of "on-ball", "deny", and "help-side" (see Basic Defense). Use a half court setup with 4-on-4. Four offensive players are positioned around the three point arc. Start with two wings and two players in the corners. Match-up four defensive players with each of the offensive players. You could also use five on each team with a point guard, two wings and two corners. Additional players can sub in and out at your discretion. The offensive players are initially stationary, with no cuts or dribbling. This is a defensive drill and the offensive players simply pass the ball around the arc. Make sure they make good passes (use this as a passing drill also), make sure they receive the ball in "triple threat" position, and have them make some skip passes too. The defensive players are not to steal or intercept the ball, since this is drill designed to emphasize proper positioning on the floor. The defensive players must work on proper relationships in positioning with the offensive player they are guarding. After drilling the basics, you can go to the "live shell" drill, or the "4-on-4-on-4 three stops drill" (below), and make it competitive. If the defender's man has the ball, he/she should be applying "on-ball" pressure, and force the offensive player toward the sideline or baseline. If your man is one pass away, you should be in "deny", but not a complete dead-ball denial as seen at the bottom of this page. You should be a little up the line and a step or two toward the ball (see Diagrams A and B). This way, you are in position to steal the pass, and yet still be able to give help to the on-ball defender if the ball-handler tries to dribble-penetrate. If your man is two passes away, you should be in "help-side". 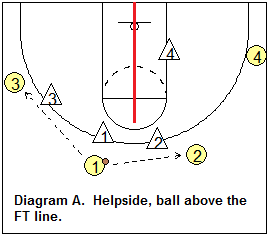 If the ball is above the free-throw line (Diagram A), the help-side defender should have one foot in the lane. 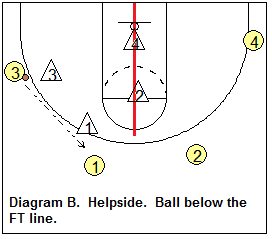 If the ball is below the free throw line (Diagram B), the help-side defenders should be straddling the "help-side line". Importantly, players must quickly rotate and sprint in and out of helpside. Sometimes players are lazy in their rotations and you must impress upon them the importance of rotating quickily. For more of an explanation, see Basic Defense. Once you feel your team has an understanding of these basic relationships, and all players have been on offense and defense, you can let them play half court all out with cutting, screens, shooting, etc. Watch the defenders carefully for proper defensive positioning. Blow your whistle when you need to make points with the players... somebody messed up, or somebody did something really well. Diagrams C and D below. Now let's assume that the ball-handler has given up the dribble. He/she no longer has the option of dribble-penetration, so defenders whose man is one pass away can now be in complete deny, on the line. 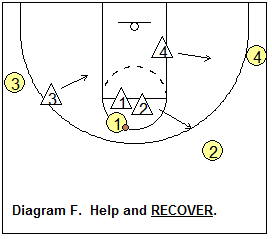 Diagrams E and F below teach how to give help and recover on the perimeter. O1 tries to dribble-penetrate. The X2 defender gives help and O1 is prevented from penetrating, and has to dish back out to O2 (Diagram F). The X2 defender then has to rotate quickly out to on-ball defense on O2, and the X1 and X4 defenders are now in deny, a little up the line and a step or two toward the ball, while the X3 defender moves into help-side (Diagram F). Diagram G teaches how to defend the cutter after the ball is passed to the corner. First, whenever a pass is made, defenders should "jump to the ball", which means that as soon as the ball leaves the passer's hands, the defenders should already be stepping toward the ball. So when O2 cuts, the X2 defender should already be in a position to step in front of the cutter and stay between the man and the ball throughout the cut. If O2 cuts out to the opposite corner or wing, note that X2 stays in the lane in helpside. O3 and O1 offensive players rotate to the right. Notice how the X3 and X1 defenders also give help on the cut inside. Bruce Weber - Shell Drill from DVD "Building a Defensive Mindset"
After teaching the basic rotations and principles above, you can "go live" and make the drill competitive. Play until one team scores five baskets. Switch defense to offense whenever there is a defensive stop. Losers do push-ups (or run). We often go 5-on-5 (with a post player) when drilling against baseline dribble-penetration and double-teaming the low post. With this drill, we have three teams. If we have 15 players on the squad, we will play 5-on-5-on-5. 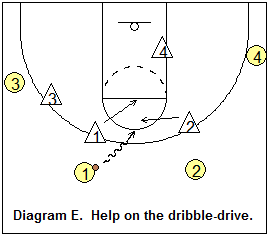 This is a quick moving half-court drill. We start with one team on offense, one on defense, and one waiting on the sideline. The first team to score five baskets wins, and the losers do push-ups or run. The offense stays on the court until they are stopped. If the defense fails to stop them, the team waiting on the side becomes the defense. If the defense stops the offense, they now become the offense, the offense goes to the sideline, and the sideline team becomes the defense. We may play two or three "games" depending on how much time we have. Keep the drill moving and make sure the sideline team steps quickly onto the floor. In fact, we even allow the offense to get a quick basket even if the defense is not yet "ready"... this teaches them to get ready and "transition" very quickly. We like this competitive, tough, half-court drill. We have three 4-player teams. A team can only win when it is on defense. One team starts on offense 4-on-4, while the other is on defense, man-to-man. The offense tries to score. If the offense scores, the defense is "out" and steps off the court, the offense becomes the defense, and the sidelined 4-player team becomes the new offense. The defensive team tries to get 3-consecutive defensive stops... it has to be three in a row. Once a defensive team accomplishes this, the drill is over and the other two teams do push-ups (or run). We may repeat this drill for two or three "games". If you have 15 players, you can also run this drill 5-on-5-on-5. See Coach Steve Bergman's "Cut-Throat" 4-on-4-on-4 drills from DVD "Building Your Half-Court Man-to-Man Defense"
This defensive drills starts with 4 defenders scrambling to cover 5 offensive players. You might notice in the video that the off-ball defenders appear to be playing a "packline" style, sagging into the driving lanes. When the coach yells "down", a fifth defender comes in and the offense starts setting downs-screens, so our defenders can work on communicating and defending down-screens. When the coach yells "live", it's 5-on-5 live with the offense trying to score and the defense trying to get a stop. From DVD - "Bob Starkey: Maximizing the Shell Drill for Defensive Success"
with Bob Starkey, Texas A & M University Assistant Coach; former coach at LSU. with Greg Lansing, Indiana State University Head Coach.